Fact: The Indian buffet is the king of buffets. Here are the common dishes you need to know to attack it like a pro. The Chinese have dim sum, the Swedish have smörgåsbord, and Indians have the buffet. Buffets are a crucial part of Indian culture, particularly at weddings, dinner parties, and other social gatherings. Part of their popularity can be explained by the fact that there’s basically an unspoken four-dish minimum for even the most basic Indian meals. One-pot meals are not frequently found in the Indian recipe canon, and the concept of asking someone if they want chicken or fish on their wedding RSVP cards is completely foreign. At Indian parties, not only can you have the chicken and the vegetable main at the same damn time, but you’re more or less expected to do exactly that, many times over. Indians are the original masters of the all-you-can-eat buffet, but they tend to swap congealing mac and cheese and jiggly jello salads for fragrant curries, fresh flatbreads, and plenty of dessert. Most dishes found on the buffet at restaurants in the U.S. hail from Punjab, a state located in the Northern part of the country where most items frequently associated with “Indian” food in the West originate. While rice-based dishes from the southern part of the country sometimes show up in the buffet spread, they’re quite rare. Indians are the original masters of the all-you-can-eat buffet. 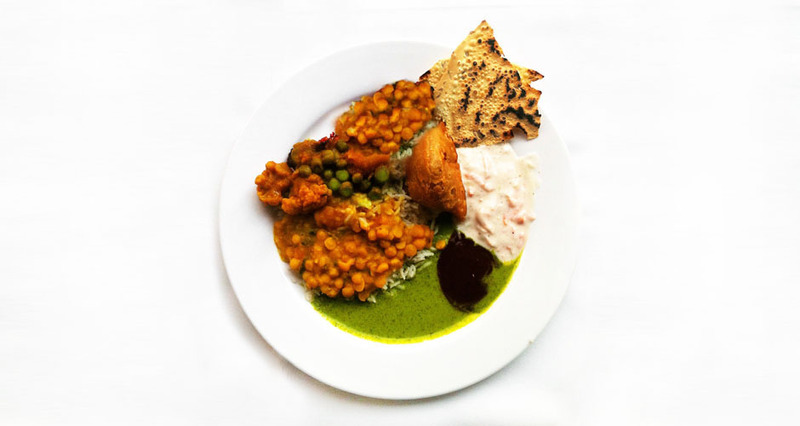 When it comes to the art of mastering the Indian buffet, it is not a game of seeing how much food you can fit onto a single plate. People are encouraged to eat multiple rounds. Appetizers and dessert don’t have to be taken separately or eaten first and last, respectively. The general plan of attack goes something like this: Cover the plate with a couple of curries and some rice; place your flatbread of choice on top; and fill separate small bowls (always available on an Indian buffet) with raita and desserts. But everyone has a different buffet style, and they are all correct, except for eating flatbreads with a fork and knife. In theory, you can easily get through an entire Indian buffet without any utensils (though spoons are totally accepted). Tear off pieces of flatbread and use them to scoop curries and vegetable dishes. The Indian buffet in sum is a balanced sensory experience—sour, spicy, creamy, crunchy, and sweet dishes can all be found in the spread. The main thing is to try as much as you can with good company. To help you navigate a typical restaurant buffet and know what you’re putting on your plate, we teamed up with Brick Lane Curry House in NYC to bring you this taxonomy of standard Indian buffet items. Study up, then head to Brick Lane for a feast. Aachar is essentially a term for mixed pickles, typically quite spicy and made with everything from cauliflower to whole chili peppers. Mango (aam ki aachar) is the most popular variety. Traditionally, raw mangos are diced (peel on) and tossed with spices like mustard seeds, fenugreek seeds, fennel seeds, nigella seeds, turmeric, and red chili powder, then placed in the sun for 3-4 days. The mango is then put in a jar and covered with oil (typically mustard oil). It’s eaten as a spicy, sour condiment that is especially good mixed with rice or slathered on parathas. The essential Indian condiment, chutneys can be made from a wide range of spices, vegetables, fruits, and oils. Typically, at least two chutneys will be present on an Indian buffet—one made from tamarind, and the other made from mint and cilantro. 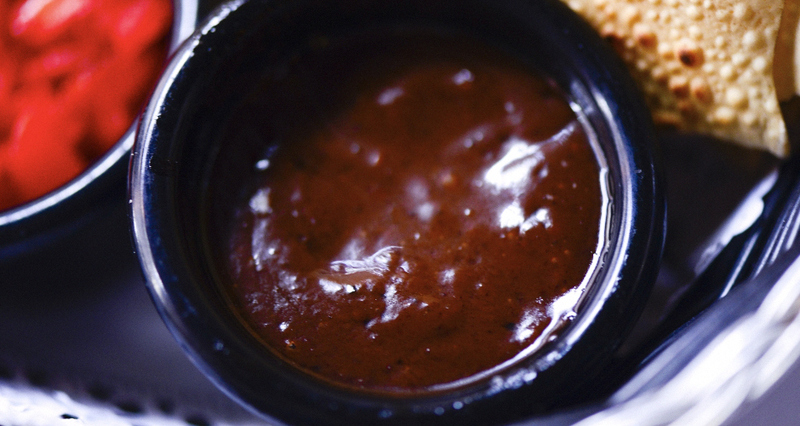 The tamarind chutney, often known as “red chutney,” is like an Indian sweet and sour sauce and is a deep maroon color. To make it, tamarind paste is brought to a boil with spices like cumin and sugar and simmered until thick. 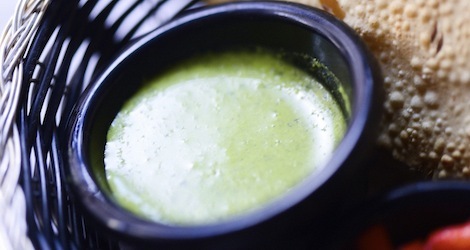 Mint and cilantro chutney, known colloquially as “green chutney” (pictured above), is spicier and livelier thanks to the addition of green chilies and some lemon juice. 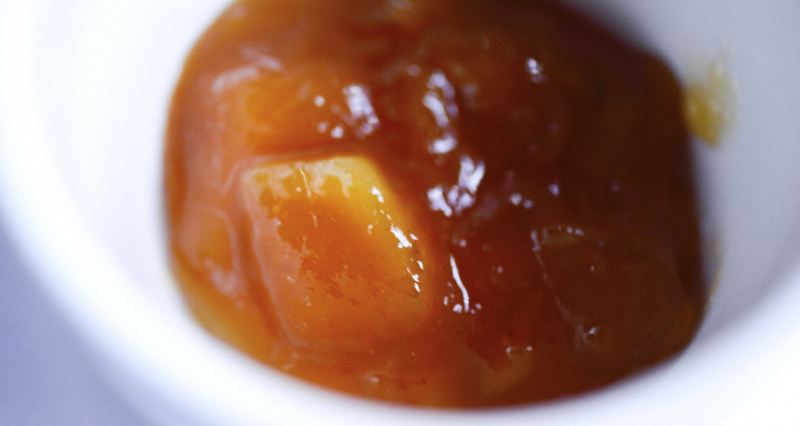 Chutneys are best eaten as a dip for samosas and pakoras. 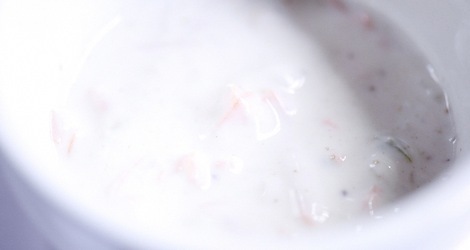 Treated like a dip or side dish, raita is a yogurt-based condiment that acts as a cooling foil to the heat from other dishes. There are multiple varieties of raita, which is more a base term; many use a raw vegetable or combination of vegetables. Cucumber raita (one of the more popular versions) is quite similar to the Greek tzatziki but instead of dill, it is seasoned with cumin, chili powder, and coriander along with diced or shredded cucumber and black pepper. It’s often garnished with cilantro or mint. Eat spoonfuls between spicy bites, or mix with a bit of rice before topping with curries. 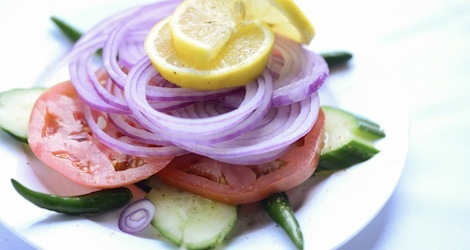 On all buffets there is some combination of sliced raw onion, lemon wedges, and tomatoes with cucumbers. The raw vegetables serve as a fresh complement to all of the cooked, spice-ladened curries, most of which taste even better with a squeeze of lemon juice and a few raw onions for added crunch. There is rarely dressing for the cucumber and tomatoes; most people just squeeze on lemon juice or simply salt them. 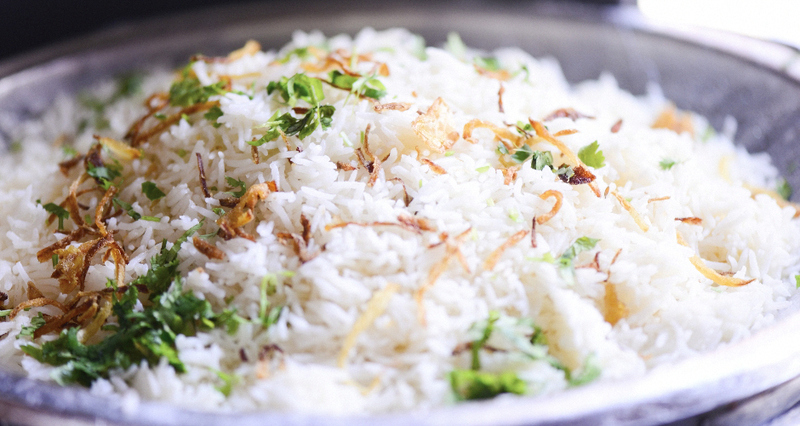 There will always be basmati rice on a buffet, and at any Indian meal in general. Mostly you’ll find it served plain, cooked with a bit of ghee (clarified butter) and jeera (cumin seeds), or as a pilaf. Basmati is a long-grain rice that is typically grown in Northern India that has a light pandan-like flavor, and it’s fluffier than standard white rice. It also does not stick together; use it as a base for heaping amounts of curry spooned on top, or simply mix it up with raita and aachar. Most bread in Indian are flatbreads that are unleavened. Naan, while a flatbread, is actually leavened and made from white flour with nigella seeds thrown in for flavor. 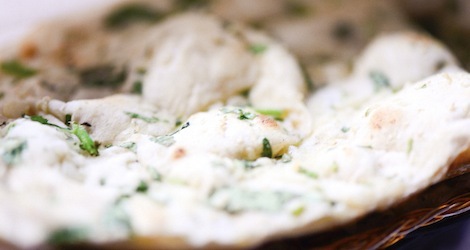 It’s thicker and fluffier than other flatbreads and is baked in a tandoor (a clay oven), then brushed with lots of ghee. The name itself comes from the Persian word for bread, and it’s most commonly made in Punjab and Northern India. There are many varieties found on Indian menus, including versions made with garlic, or stuffed with lamb (keema) or a mixture of nuts and raisins. 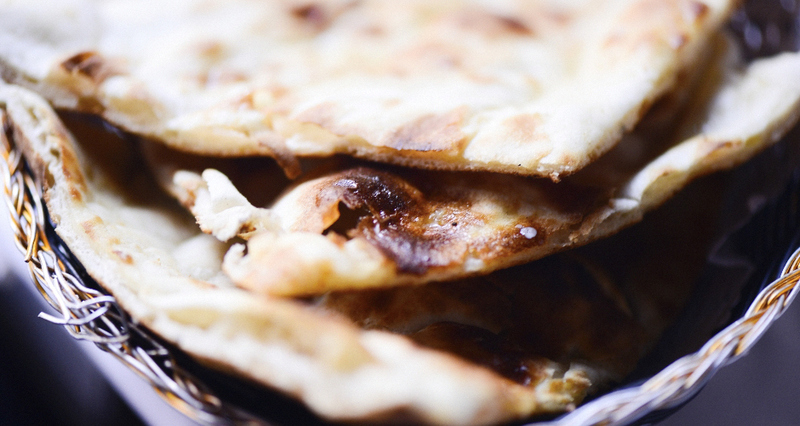 In the context of an Indian buffet, naan is the ultimate tool for scooping up fragrant curries. Definitely ask the restaurant if it can serve you a batch fresh from the tandoor with loads of ghee, not the ones sitting under the buffet lamps. Roti and paratha are both flatbreads that are typically found on an Indian buffet, though they both might not be present at the same time. Rotis are simply made from stoneground whole-meal flour and water; they’re either grilled or baked in a tandoor. 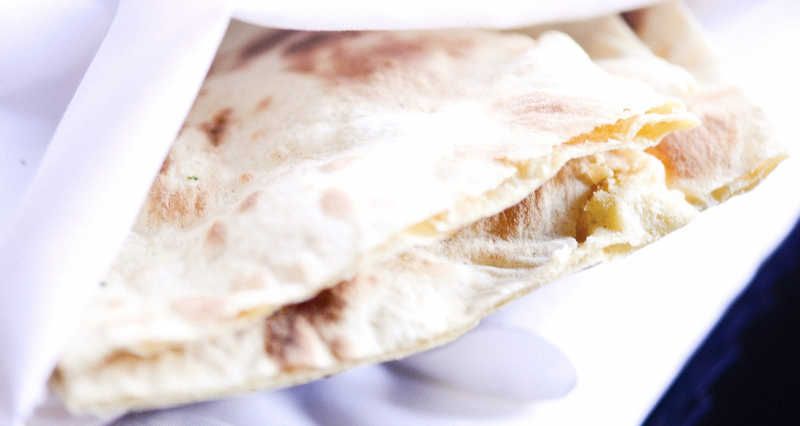 Paratha translates to “layered,” and it is also made from atta flour (whole-meal flour); the rolled dough is brushed with oil and folded over itself many times before hitting the grill. 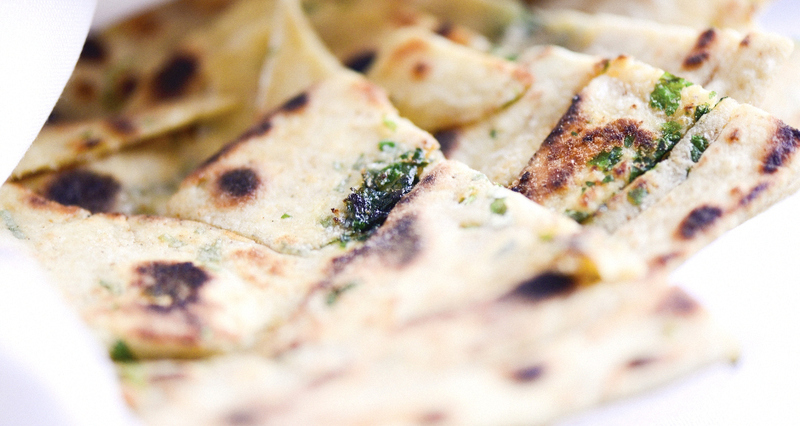 The result is an ultra flakey, thin flatbread that pairs really well with most Northern-style curries. 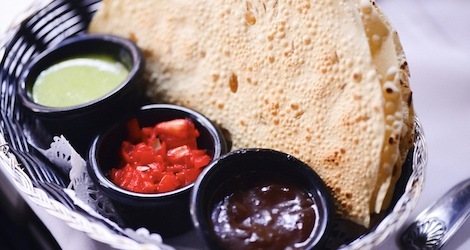 Instead of a bread basket, most Indian restaurants start meals off with these thin, crispy discs made from seasoned black gram flour and served with an assortment of chutneys and spiced pickles for dipping. To make them, cooks tradtionally roll out dough into thin, flat rounds and leave them to dry in the sun. The discs are then either deep-fried or cooked over an open flame depending on the texture desired. Papadums are actually linked to the feminist empowerment movement in India where women would start their own papad-making companies to provide themselves a stable income with minimal start-up costs. The exact history of chicken tikka masala is hotly debated, but most agree that it did not actually originate in the homeland—it was created by Indian cooks in Britain, where it became so popular that it’s largely considered to be the national dish of England. 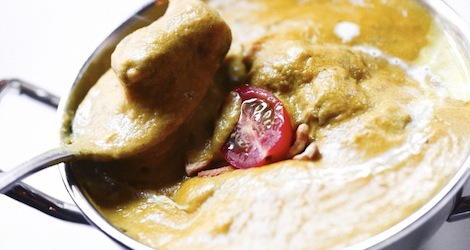 Chunks of chicken that have been marinated in yogurt, lemon, and spices and baked in a tandoor oven are simmered in a sauce made from a tomato-onion gravy with plenty of cream; the mix of spices isn’t standard but often includes some combination of cumin, turmeric, garam masala, and ginger. It’s very similar to the Indian shahi curry and butter chicken curry, but spicier. Perhaps the best known “Indian dish,” it’s super creamy, thick, and tomato-y, and best served over rice to help soak up the sauce. 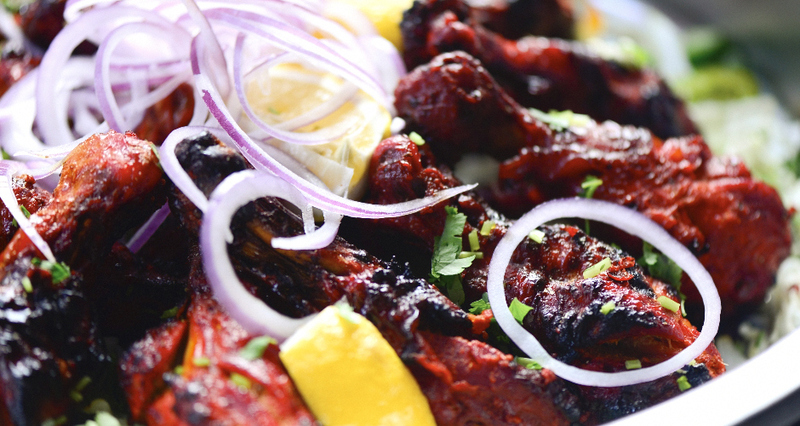 Bright red in color, tandoori chicken’s popularity is attributed to Kundan Lal Gujral, who opened the first Moti Mahal in 1920 and then moved the shop to Delhi after the Partition of India. India’s first prime minister, Jawaharlal Nehru, was reportedly so impressed by the dish that he requested it be served at official banquets. To make it, chicken is marinated in yogurt that has been seasoned with garam masala, garlic, ginger, onion and often lemon juice, as well as cayenne pepper or paprika (which contributes the red hue). It is then baked at incredibly high temperatures in a tandoor oven. The chicken is often quite fiery in India, but the spices are commonly toned down for the Western palate, and red food coloring is sometimes used to achieve the correct color. It’s best eaten right off the bone, sometimes with a fork and knife, similar to baked wings. 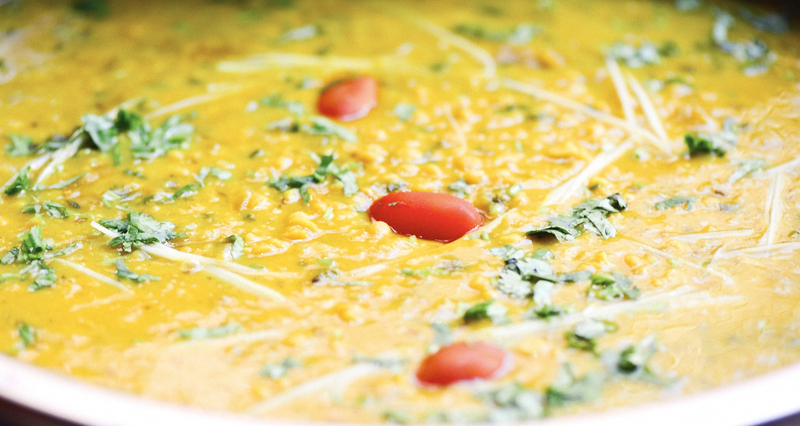 Korma means “braised,” and this dish rose to popularity during the rule of the Moghul Empire in India. 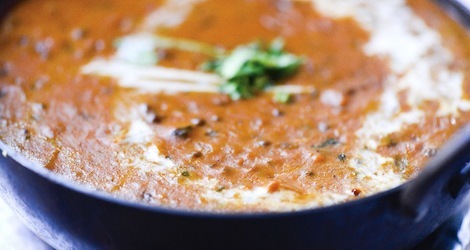 The gravy is mostly made from tomato and onions, as well as yogurt that is cooked below curdling temperatures, slowly over a low fire, with spices like coriander, cardamom, turmeric, and cinnamon. Lamb pieces that have been browned are then added to the gravy with their juices, and the stew-like curry is simmered until the meat is very tender. Not all recipes use yogurt; some alternatives include coconut milk and whole milk. 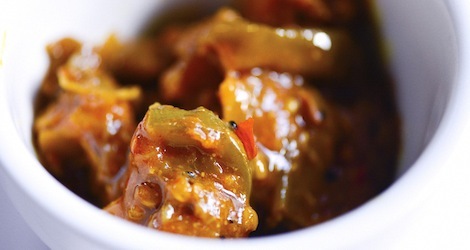 While lamb is often served as a korma, other proteins like chicken are often used as well. Lamb can also be found on the buffet in the form of lamb vindaloo—a curry that has roots in Goa, Portugal’s former colony in India. 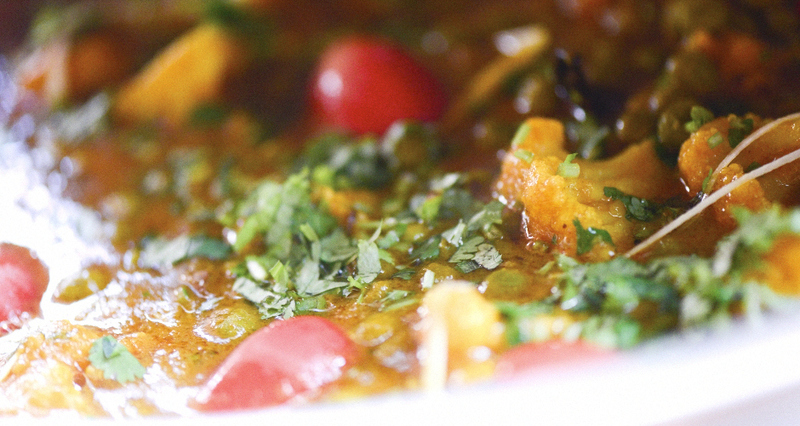 The dish is incredibly spicy (much spicier than a korma) and is popular across the U.K. The name literally translates to potatoes (aloo) with cauliflower (gobi), and it’s a dry dish with gravy sauce. It’s also the dish that became so associated with the film Bend it Like Beckham that the DVD includes an aloo gobi cooking lesson from the director and her mom. Cauliflower florets and potatoes are sautéed with oil, turmeric (which lends a bright yellow color), cumin, asafetida, coriander, ginger, red chili powder, and dried mango powder. The vegetables are then lightly steamed until tender and often garnished with fresh chopped cilantro before serving. Aloo gobi is best eaten with roti or paratha instead of naan. 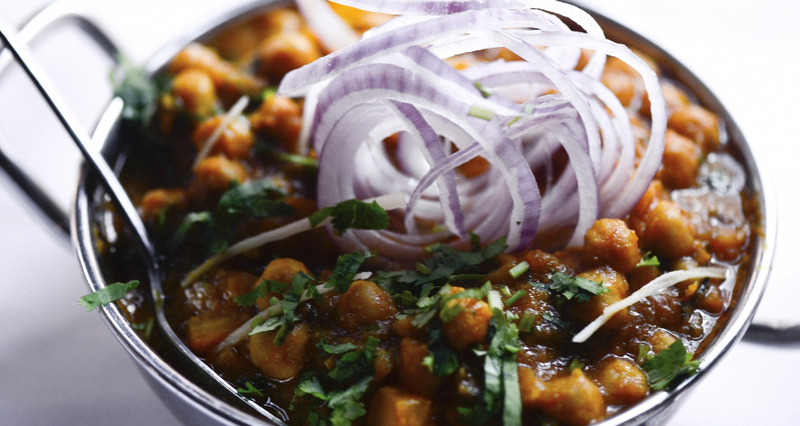 Also known as chole (cho-lay), this dish is most popular in Northern Indian (namely in Punjab), and it is made from chickpeas simmered in a tangy and slightly sour gravy featuring tomatoes, onion, and sometimes garlic, plus a spice mixture consisting of crushed coriander, ginger, red chili powder, garam masala, and amchur (a powder made from dried mangos). As far as curries go, this one is is much drier and rarely made with cream. Mix it with rice and eat by the spoonful, or tear off bits of naan or roti and use them to scoop up the chickpeas. Saag, which translates to “greens” in Hindi, can be made from a variety of greens such as spinach (most common), collards, or even mustard greens—whatever is fresh and seasonal. 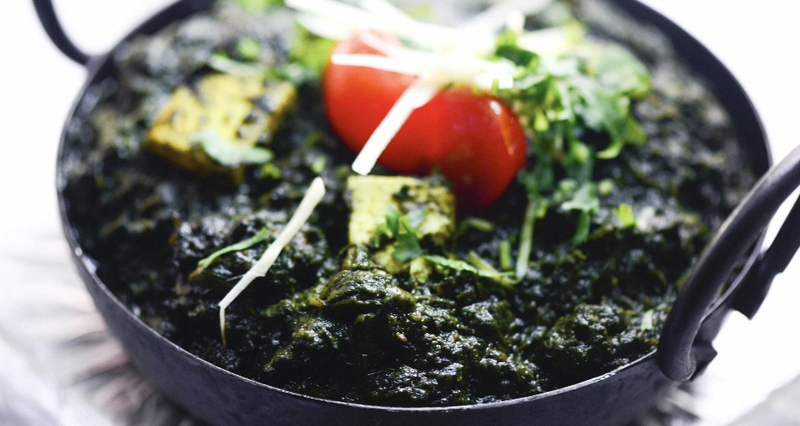 (If you see palak paneer, that means it’s made solely from spinach.) The base of this curry deviates from the typical tomato-onion mixture and instead consists of fenugreek and wilted greens cooked with cumin, onion, garlic, ginger, green chilies, and garam masala. These ingredients are often pureed to achieve a velvety smooth texture. 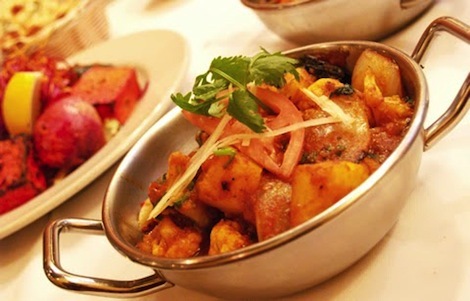 Paneer (an un-aged cheese similar to a farmer’s cheese) cubes are often pan-fried before being added to the greens, and the dish is typically finished off with cream at restaurants. It’s mildly spicy and super smooth, and best eaten with naan (you can also serve it over rice). 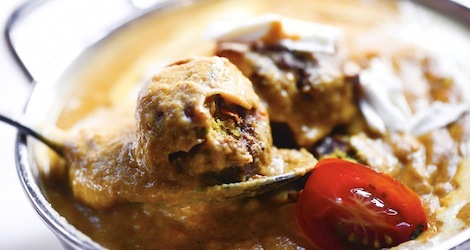 These vegetarian “meatballs”—simmered in a mild, creamy, and thick tomato-onion gravy—are also believe to have originated during the time of the Mughul Empire. While recipes vary, the balls (kofta) are typically made from a mixture of steamed and mashed potato, mixed vegetables such as peas and carrots, and a bit of paneer. The mixture is rolled and fried before being added to the gravy, which starts with a base of tomatoes, onions, ginger, garlic, coriander, cumin, and red chili powders, as well as a paste made from crushed cashews. This dish is best eaten with torn pieces of naan or over rice. 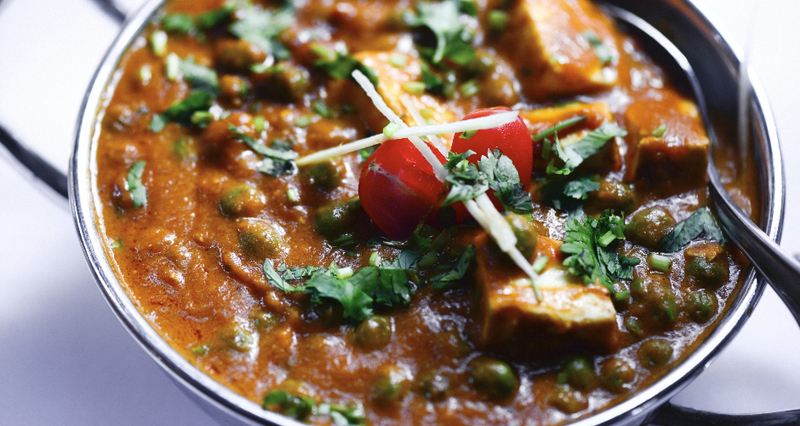 One of the most popular vegetarian Indian curries, mattar paneer is made from peas (mutter) and cottage cheese (paneer). 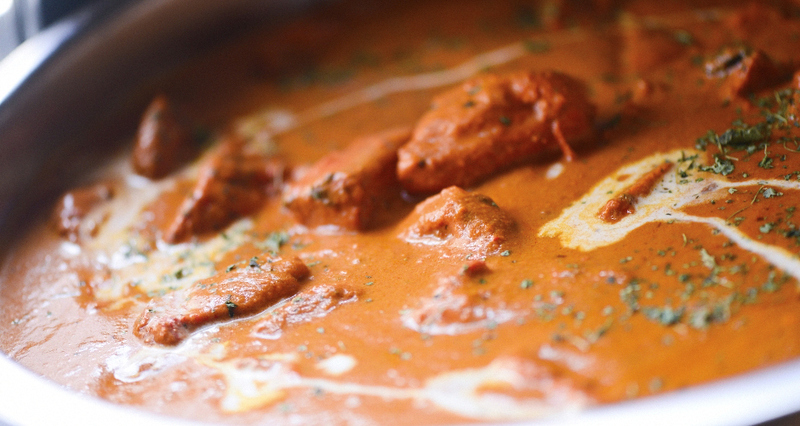 The sauce is made from the same tomato-onion gravy that is the base of many other curries. This one is incredibly creamy and typically somewhat spicy; it’s flavored with ginger, green chilies, powered coriander, cumin, turmeric, red chili, and garam masala. The sauce is simmered and often blended to reach an ultra-smooth consistency before fresh or frozen green peas and cubes of paneer are folded in. The curry is often finished off with a swirl (or more) of cream to add even more body and richness, then topped with dried fenugreek. A staple dish from the state of Punjab, this dish became popular all over India after the Partition when many Punjabis people were forced to migrate to other parts of the country. Daal, which translates simply to “lentils,” is made from urad daal, or whole black lentils, with red kidney beans that are simmered in a rich and thick sauce made with ghee (clarified butter), chopped ginger, garlic, onion, tomatoes, garam masala, fenugreek, red chili powder, and sometimes cinnamon. The traditional preparation of the dish usually requires around 24 hours, but thanks to the magic of the pressure cooker, it can be cooked in less than a couple of hours. It’s best finished with a drizzle of cream for added richness. Channa daal is similar to channa masala, but with a more saucy gravy. It also originates from Punjab and is made with yellow lentils simmered in a gravy made from tomatoes, onions, garlic, and spice mixture including crushed coriander, ginger, red chili powder, and garam masala. This one is best served over a heaping pile of rice. 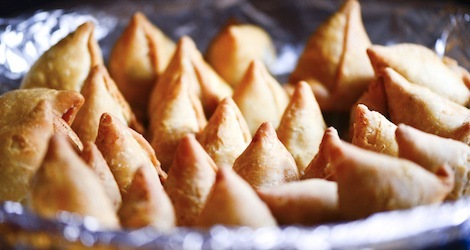 While it actually originated in the Middle East (where it’s known as sambusak) around the 10th century, the savory pastry is one of India’s most popular foods. Typically triangle-shaped and deep-fried, it is commonly filled with a mixture of spiced boiled potatoes and peas. Other fillings include ground lamb, beef, or chicken, as well as lentils or paneer. The outer shell is made from maida flour, which is similar to cake flour and yields a flakey and layered exterior. There are many regional variations, as well as ones that are bite-size or baked, but those are not as common as the fried, potato-and-pea version. Samosas are eaten by hand, dipped in tamarind or mint chutneys. This deep-fried fritter is typically made from vegetables like potato, onion, eggplant, plantains, or cauliflower coated in a gram flour (also known as besan) batter—it’s similar to Japanese tempura, but with a heavier batter. Onion bhaji in particular are very popular across the U.K. and can typically be found on most Indian restaurant menus there. 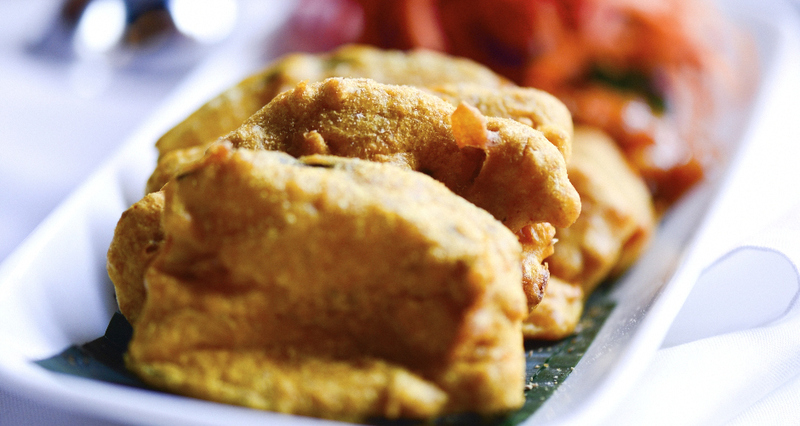 Pakoras are best when dipped in chutneys, namely ones made from tamarind and cilantro. Paneer is also often cooked in this manner, but meat is not common. 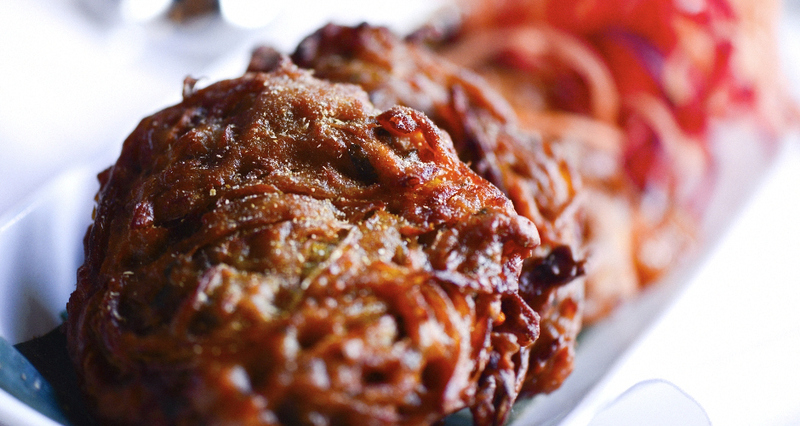 Pakoras should be eaten hot out of the fryer so that the exterior is crunchy and the interior is soft. This take on rice pudding is popular across all parts of India, although it is known as payasam in the south. It’s made from a base of rice boiled low and slow with milk and sugar, often garnished with raisins and some sort of nut (typically cashews, pistachios, or almonds) and flavored with saffron and cardamom. The dish can also be made from vermicelli, but rice is more popular, especially in the Northern state of Punjab where kheer is a dessert-station staple. 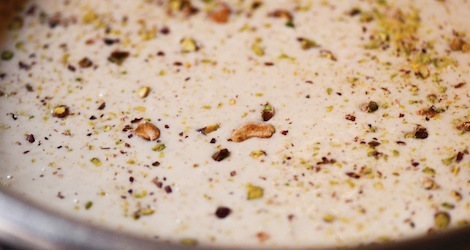 Kheer is also often found at celebrations like weddings and religious festivities at Hindu temples; it can be served cold or hot. 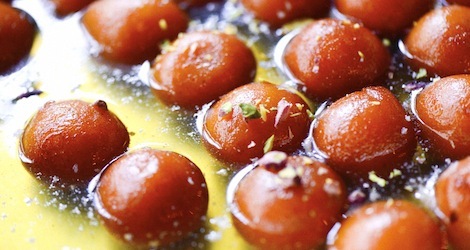 Gulab translates to “rose,” while jamun is a reference to an Indian fruit similar in size and shape to these mini doughnuts—one of the most popular desserts across India, Nepal, Bangladesh, and Sri Lanka. Thought to have originated around the time of Moghul Empire, the dessert consists of a dumpling, typically the size of a golf ball, that is formed from khoya (milk solids), then fried until golden and soaked in simple syrup that is often flavored with saffron or rose. 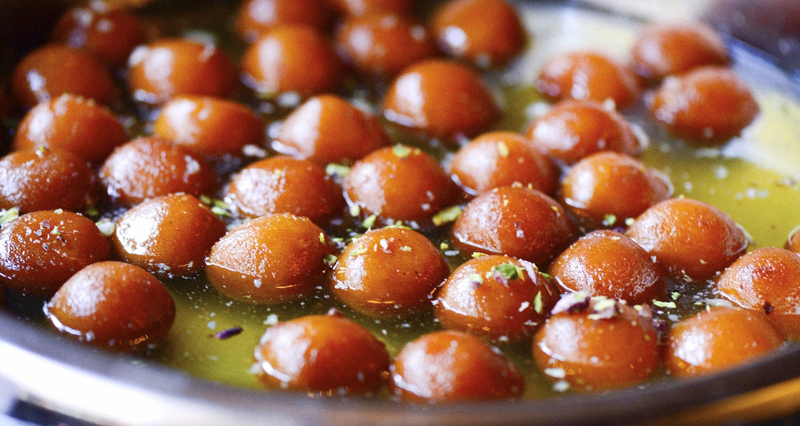 Gulab jamun is best served hot (but is also obscenely good cold) and topped with crushed pistachios. Typically a serving is two or three dumplings per person. Most Indian buffets have a simple fruit salad option, which often falls pray to the usual restaurant ratios—namely, a boatload of under-ripe honey dew and cantaloupe with the occasional grape or apple chunk lurking beneath. Sometimes, higher-end places feature a version popular amongst those of Gujurati origin made with chilled sweetened milk, and bananas and papaya in place of melon—it’s flavored with custard powder and cardamom and often has cashews mixed in for added crunch. It is always served cold. Special thanks to Brick Lane for the delicious spread.